We flew in Qantas-style this morning and found our way to the delightful Novotel Rockford Darling Harbour - chosen for its central location and the fact I had a free night owing me on my Accor club card, and it was the most expensive I could snag. Nice. 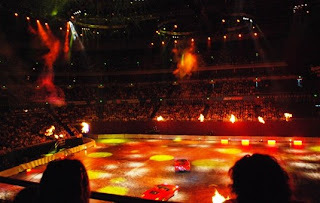 After a wander around Chinatown and Darling Harbour for a spot of lunch, we grabbed some train tickets and headed out to Acer Arena for the 5pm show. It began with several "live" ads for Shell, Navman & Audi, which were reasonably entertaining, but not enough to stop one joyful fellow a few bleaches away from our side-of-stage spot from yelling out "Get off!". Charming. 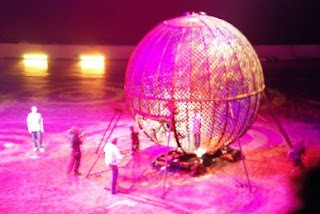 Still, it wasn't long before Richard "the Hamster" Hammond and Jeremy "Murder a Prostitute" Clarkson took the stage. Sadly James May was absent, a gap kinda-sorta-filled by Top Gear Australia host Steve Pizzati. He was enthusiastic enough, and took his required savage ribbing from the two Poms with good humour - but his distinct Aussie twang just sounded strange next to Clarkson and Hammond's proper British accents. Other TV show favourites made an appearance, including the "Cool Wall" (Aston Martins - yay! Porsches - boo! 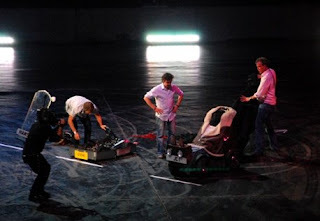 ), and a video-game version of "Star in a Reasonably-Priced Car", in which audience noise was used to power the car around the famous Top Gear test track. Our performance was not good; we finished in the bottom half of the leaderboard, much to Steve Pizzati's disappointment. 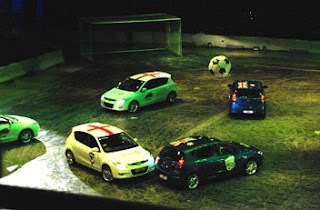 But finally, what everyone was waiting for - CAR SOCCER! England V Australia - Hammond led the Poms to an early lead, but Pizzati and the good ol' Aussies fought back to a commanding 4-1 win. The drivers were absolutely brilliant in their Hyundais, but they couldn't avoid crashes, and there was a great bingle just below our stand. We stay for the crashes, after all. The show ended with The Stig finally making an appearance, to drive a Lotus around the floor while a 3D Apache helicopter "chased" him from the big screen, shooting missiles along the way. Clarkson eventually "took down" the phantom Apache with a bazooka, leading to a final round of fireworks and a prompt "Thank you and goodbye!" All in all it was an hour and a half of silly fun - but could've really done with more Stig and James May. It was obviously scripted, but many of the funniest moments came when Clarkson and Hammond did riff off each other. 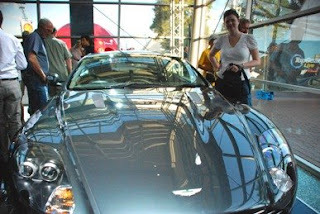 Oh yes, my friend - that is an Aston-Martin DBS Coupe. This is number 1 on my fantasy wish list. Number Two is David Tennant in the passenger seat, and number 3 is the James Bond-style kit out. My number 4 would be what happens to the car when it hits 88 miles per hour. An Aston-Martin DBS Coupe, in Bris Vegas Traffic? I am asuuming that you would have to sell a kidney for the insurance here, or simply not drive it anywhere near the city in peak hour? P.S. Dam fine choice of car though. Sounds like a lot squeezed into an hour and a half :) I'd love to be able to afford the insurance on an Aston Martin! I use to do security at greenslopes private and one of the cosmetic surgeons had your car. Still got a photo of it on my phone. Nice bloke too. Sounded like a cool show. The Aussie version seems to be struggling. To much damage to cars lent is an issue as well. Sounds like the car manufacturers are getting the shits. Top Gear looks totally up my alley (though not as good as Mythbusters), I've got it on hold with Bigpond DVD.